Reception children have settled well into their classes and routines. We have been focussing on establishing friendships, sharing and being kind to other. Our topic focus is Traditional Tales and we have enjoyed exploring a range of texts. We have been retelling the stories using props in our role play areas and small world activities. This week we have been reading 'Goldilocks and the Three Bears' and 'The Magic Porridge Pot' and we even made and tasted porridge. The children developed their design skills when creating a range of models at the workshop tables. We focused on joining a range of materials which then supported the children to make models independently. 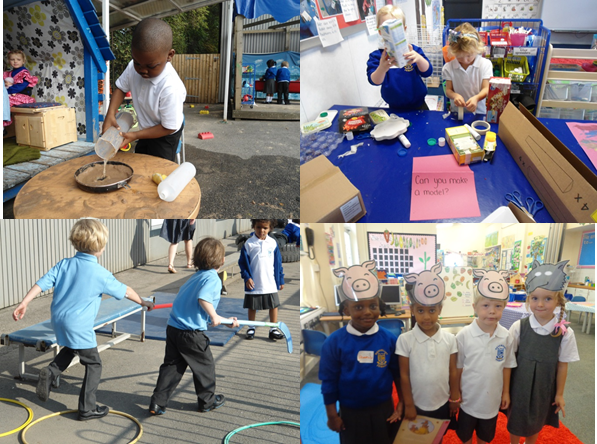 We enjoyed learning about the changes in Autumn and exploring the differences in the weather and the environment. We read and studied Helen Cooper's trilogy about Pumpkin Soup. This formed the basis of our creative activities. The children had the opportunity to cook, paint and create a variety of models. The children performed a fantastic Christmas show and learned how to cooperate and work as part of a team. They also used their workshop skills to create a range of Winter crafts. During the first half of the Spring term we will be enjoying our exciting topic on "Superheroes". We will choose a variety of different Superheroes including, The Big Friendly Wolf as well as the traditional characters such as Spiderman and Batman. We will also cover heroes in our own lives and link this to our PSED curriculum. We intend to discuss the characteristics that we admire in a hero and talk about how we would like to emulate this in our everyday lives. This topic is guaranteed to motivate children in Reception to write captions and phrases for their models and 'superhero' capes. We are creating role-play areas in all three classrooms that reflect different aspects of our topic. "New Life" is the topic for the second half of term. We plan to grow a variety of seeds and beans in class and the books we have chosen, 'Jack and the Beanstalk' and 'Jasper's Beanstalk' are excellent texts to engage the children in all aspects of learning especially Understanding the World and Shape, Space and Measure. We intend to look at non-fiction texts such as 'A Bean Diary' and 'A Frog Life-Cycle'. We are looking forward to finishing off the term by going on a Spring walk, hunting for signs of Spring such as frog spawn in the school pond and buds appearing on the trees. During the first half term we enjoyed our topic of 'animals'. We had an interesting educational visit to London Aquarium. During our visit we were lucky enough to see a range of animals including sharks, jellyfish and a crocodile. As part of the topic we enjoyed learning about caring for animals through our exploration of non-fiction texts as well as a range of engaging fictional stories. 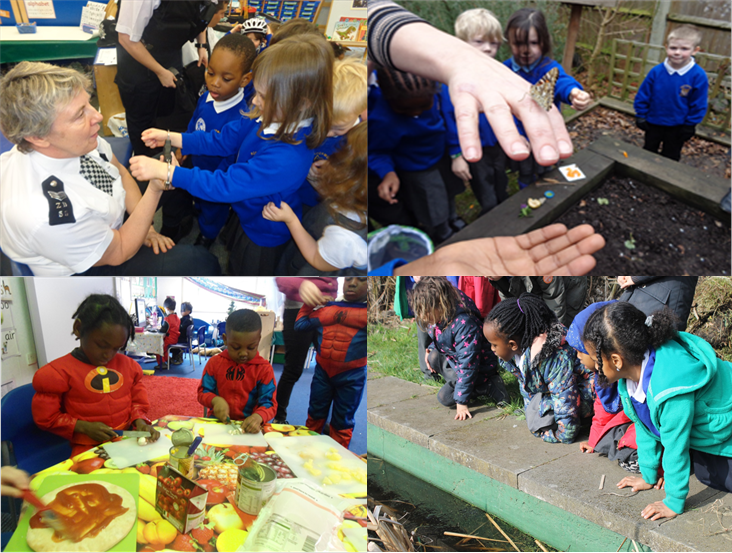 We also enjoyed ‘visiting’ a range of habitats, in different countries, to learn interesting facts about different animals. ‘Water’ is the topic for the second half term. 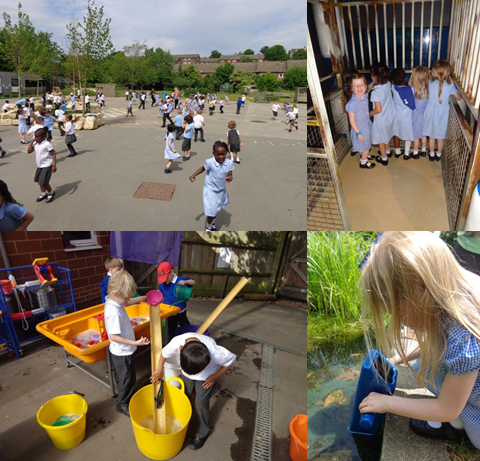 The children have enjoyed exciting activities including pond dipping, on Outdoor Classroom Day, and making a range of ‘under the sea’ models. During this topic all classes have enjoyed creating maps and messages in a bottle to help the pirates find the treasure! The children have also been learning about the importance of exercise and keeping healthy during Healthy Schools Week. We have made healthy sandwiches and taken part in multi-skills activities. We also had great fun dancing outside to raise money for the NSPCC.